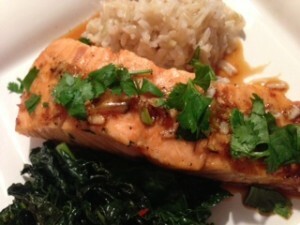 This simple salmon recipe is a hit with my whole family! Place all the ingredients, except the salmon in a bowl and whisk together. Remove 2 tablespoons of the sauce and set aside. Place the salmon in a glass baking dish and cover each piece with the remaining sauce. Bake in the oven until cooked through 12-15 minutes. Drizzle with the remaining sauce and garnish with: fresh cilantro, mint, or basil if desired.